Nintendo is no stranger when it comes to attention to detail. Whether it’s the latest game or the classics, the company thrives on precision throughout its development and production processes. 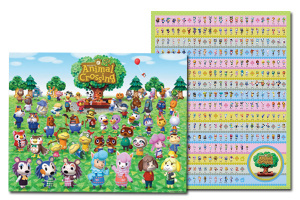 Thank you for your recent order of the Animal Crossing: New Leaf 2-Poster Set reward. We wanted to let you know that we recently discovered some errors in the list of character names on one of these posters. We’ve corrected these details and will be shipping you the new and improved version of the poster shortly, free of charge. We apologize for any inconvenience. You should receive a shipping confirmation email within the next few days. 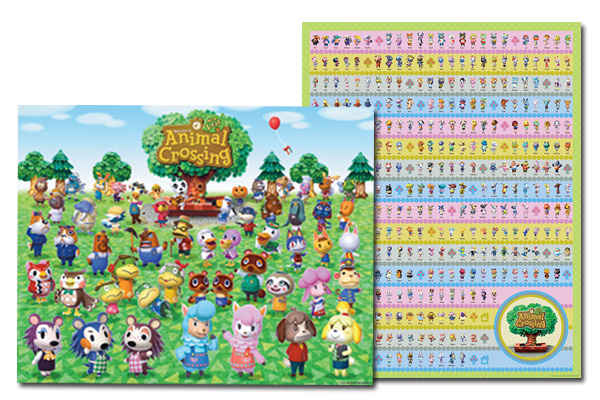 In the meantime, please verify that we have your current shipping address on file by visiting club.nintendo.com. We appreciate your patience, and thank you for being a member of Club Nintendo." If you live in North America, let us know in the comments if you also ordered this catalogue item and are awaiting your error-free replacement. Thanks to babyguess for the heads up. Though I didn't get this poster set, I am glad to see Nintendo keeping accuracy one of their priorities for something as small as Club Nintendo. I got this email, too. There are so many animal names on the one poster, I didn't even look through all of them. It's a great poster set and I'm glad they are correcting the problems, though. I got an email similar to this with the Zelda Anniversary Poster set a year or two ago. There was a printing defect on the Skyward Sword poster. A brown outline that missed it's mark around one of the characters, but it was so small you would have never noticed it. It's nice to see that they take care of the problem even if you don't complain. At least it's not as glaring as "Resident Evil: Revelaitons." Errors like this are what make certain baseball cards become rare and potentially very valuable! "Inconvenience"??? Whomever received the poster with the error is in possession of a rare collector's item now. Lucky ducks! I got my Re-Shipping notice on Monday! @Dark-Link73 Correct! The misprint posters have a better value now, just like a misprint on real currency or coins. Anyone willing to donate one of those posters to a poor unemployed European? Nintendo is always great with customer service. When was this poster set wtf?!?! What was the error? I got these about a month ago and I just got the email. They shipped mine out the other day. I'm not entirely sure what the error was, exactly, though. But hey, free poster! The error lies in about 10 character names. There are like over 300 on the poster. I don't know why I can imagine if this happened in Europe customer services would either do nothing or deny that there is anything wrong. These posters just got more valuable! Examples: they call Fang Freya and call Freya Dobie. I was perfectly willing to live with it, but this is cool. Good. It's been down for at least 2 days now. I need to finish a couple surveys. dang it should of ordered this poster set! Got the error'd zelda poster at least.